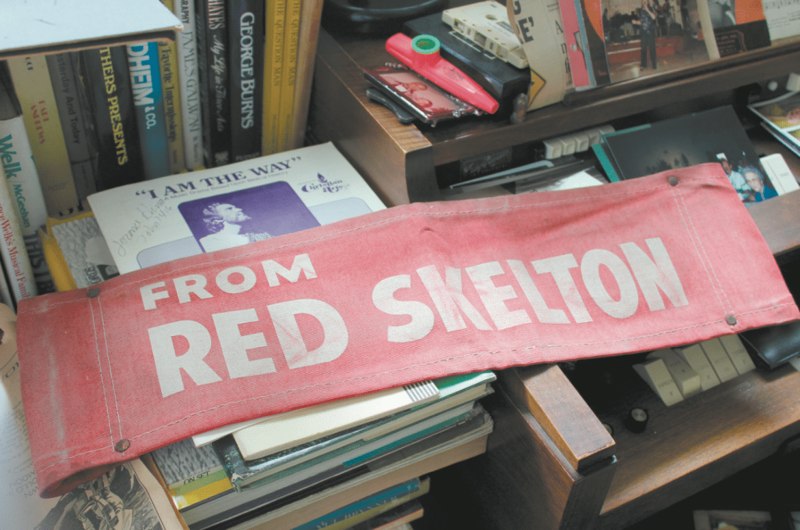 A constant throughout Bobbye Weaver’s collection of entertainment memorabilia and memories is Red Skelton, one of the many celebrities Weaver and her late husband, Emmett, formed friendships with over the years. Journal photo by Emily Williams. It all began with a wink. Home from college for Christmas break, Bobbye Weaver, nee Williamson, winked at a handsome young Emmett Weaver, editor for the Pell City News-Aegis, as he stood on her doorstep. He took it as an act of flirtation rather than what it was – a small little tick. The two went across the street for a coke and what followed was a 63-year marriage filled with celebrities, the stage, stories and thousands of pieces of cinematic history that the couple collected through Emmett’s career in entertainment journalism with the Birmingham Post-Herald. The late Emmett Weaver, a native of Anniston, will soon be celebrated along with Bobbye as their collection of historic cinematic, musical and theatrical memorabilia goes on display at the Oxford Performing Arts Center in 2019. Emmett started his life going in a far different direction than the one he wound up taking. A pre-med student at the University of Alabama, he joined the Navy to serve as a medic corpsman in World War II, where he learned he could not be a doctor like his father. When he returned to school after the war, he changed his major to journalism and communications – which led him to Bobbye’s doorstep. The couple soon married and moved back to the University of Alabama, where Bobbye finished her degree in classical piano and Emmett finished his master’s degree. Emmett then enlisted in the Army Reserves for the much-needed $35 a month pay and, not a month later, the couple relocated to Camp Lejeune in North Carolina in response to the Korean Conflict. Emmett was never deployed for battle, and the couple was later moved to New York, where Emmett finished up his service and Bobbye developed her love of theater and public relations. Throughout his career, Emmett attended at least 25 world premieres among other premieres of films and plays he reviewed for the Post-Herald. “I accompanied him on most of them. Most of the time, what I was doing was with WSGN/WCRT Radio,” Bobbye said. She would chaperone the Miss Alabama contestant in the Miss Universe pageant and report back with stories. 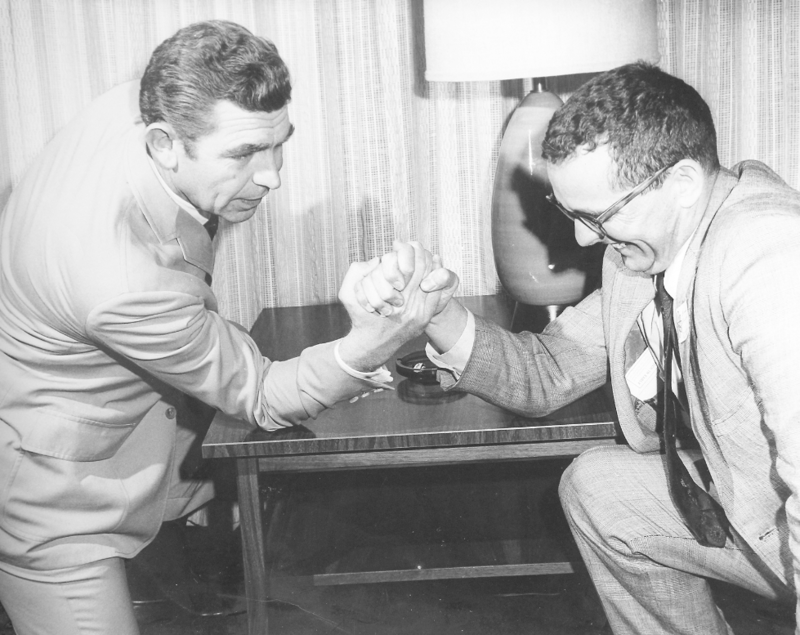 Andy Griffith arm wrestles with Emmett Weaver. Photos courtesy Bobbye Weaver. It was at these many premieres, with Emmett interviewing actors and reviewing the films, that the Weavers began developing relationships, often friendships, with many of the celebrities they encountered. It didn’t hurt that Emmett’s reviews grew highly respected. A fan of many Woody Allen films, Emmett wasn’t terribly fond of “Annie Hall,” and his slightly negative review elicited a heartfelt thank you letter from Allen. Many similar letters are tucked throughout photo albums filled with famous faces. A premier in those days was a much more intimate affair, where reporters spent time getting to know the stars rather than shouting at them from the sidelines of a red carpet. While others who attended the events might have stood in awe of the stars, Bobbye and Emmett treated them the same as anyone else. As a result, the Weavers received a steady stream of little gifts from actors they knew: Christmas cards, signed photos, commemorative mugs, ash trays and T-shirts. Many of those personal gifts will be on display at the Oxford Performing Arts Center. The collection also includes two original scripts signed by Neil Simon, which Bobbye treasures; a pristine belt buckle sent by Elvis Presley; and a ring sent by Elizabeth Taylor that is a copy of the 29.4 carat diamond given to her by Mike Todd, which Bobbye wore in her one-woman show. Another highly valuable piece, according to Bobbye, is a copy of the original script of the “War of the Worlds” radio broadcast sent to Emmett with a letter from the show’s narrator, Orson Welles. It didn’t stop at gifts. The many photos of Emmett and/or Bobbye alongside celebrities recall many amazing moments. While having dinner at The Hollywood Palladium with a group of Miss Universe contestants, Bobbye met Lawrence Welk, who already had a relationship with her husband. “I really was almost ready to swoon then, because he was my idol,” she said. As the music played, she began drumming her hands on the table to the beat to stay calm. When Welk took notice, he told her she had natural talent and even wanted her to join him on tour. She didn’t join his troupe, but she did learn how to play the drums, performing locally and teaching drum lessons to children for many years. 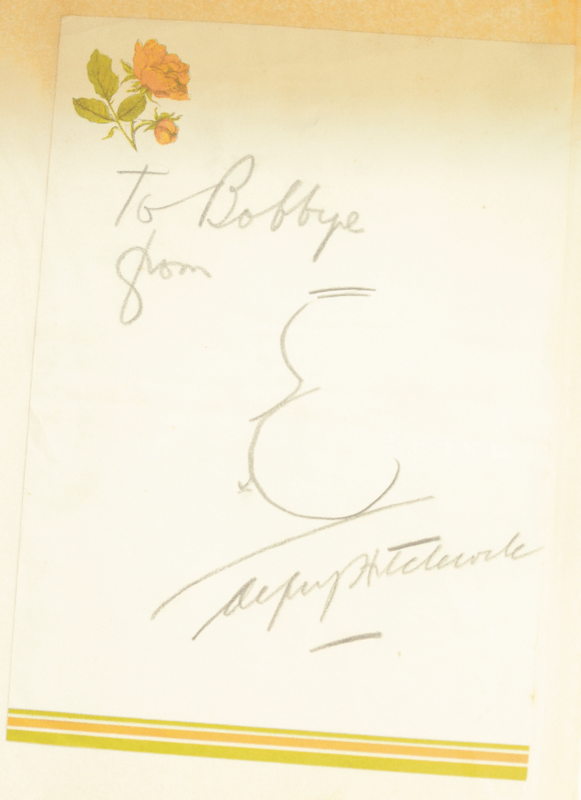 An autograph by Alfred Hitchcock for Bobbye Weaver. She notes that the note is quite rare due to the signature sketch of his own profile. In 1973, Welk visited Birmingham and called the Weavers, requesting that Bobbye play drums with him in the Dixieland jazz section of his show. The couple met Johnny Carson in 1950 while in New York to see a Broadway show. A friend at ABC talked them into being on Carson’s game show “Who Do You Trust?” and Bobbye and Emmett left the winners of $3,000. 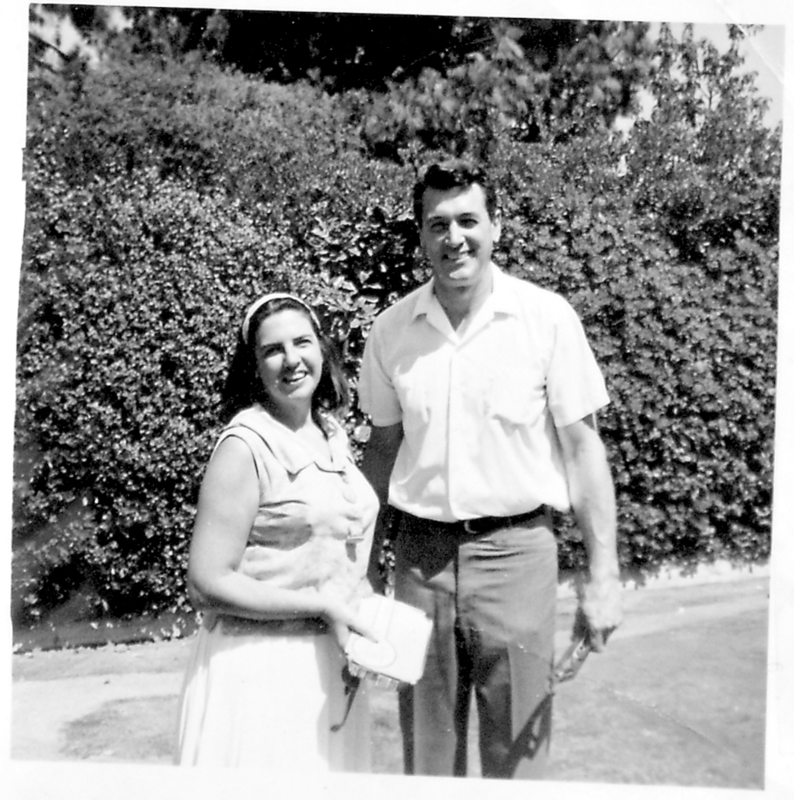 Proving nearly all of her photos have a story attached, Bobbye showed a photo of herself with the handsome Rock Hudson, whom she visited at his home with a busload of Miss Universe contestants. Emmett later ran into him at the premiere of “The Undefeated,” and Hudson told him he remembered Bobbye’s battle with the fence and sent Emmett home with autographs from himself and John Wayne along with sepia copies of stills from the film. A constant throughout her collection is Red Skelton, who became a close friend of the Weavers. Each time his image appears, Bobbye said, “And there’s old Red” with a wide smile. “He truly was the kindest man and a great friend,” she said. Skelton gifted the Weavers a short-leaf pine that thrived until it was taken down by the April 2011 tornadoes. He also gifted them one of his director’s chairs, which complimented one that Vann Williams had personalized for Emmett. 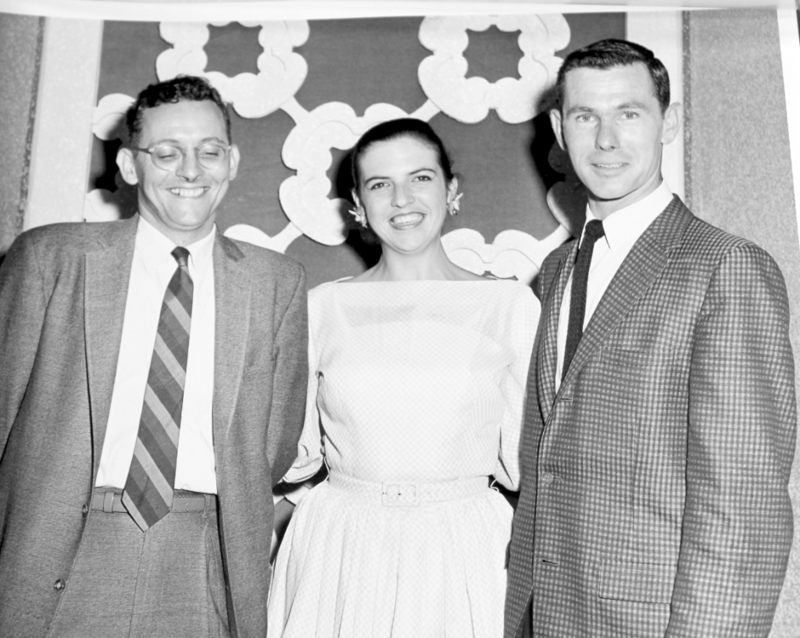 Emmett and Bobbye Weaver with Johnny Carson. During that time, when they weren’t traveling the couple immersed themselves in the local arts community. Bobbye often took to the stage at the Town and Gown Theatre and worked with the Summerfest Musical Theatre, which was co-founded by Emmett, James Hatcher and Birmingham Mayor David Vann. The couple often invited their famous friends and acquaintances to visit the city, including the incomparable Judy Garland. Through their shared love of theater and the arts, Bobbye became close friends with Eleanor Bridges, a painter, and her husband, George, a sculptor, whose house in Homewood was often a spot where the Weavers would take their famous visitors. 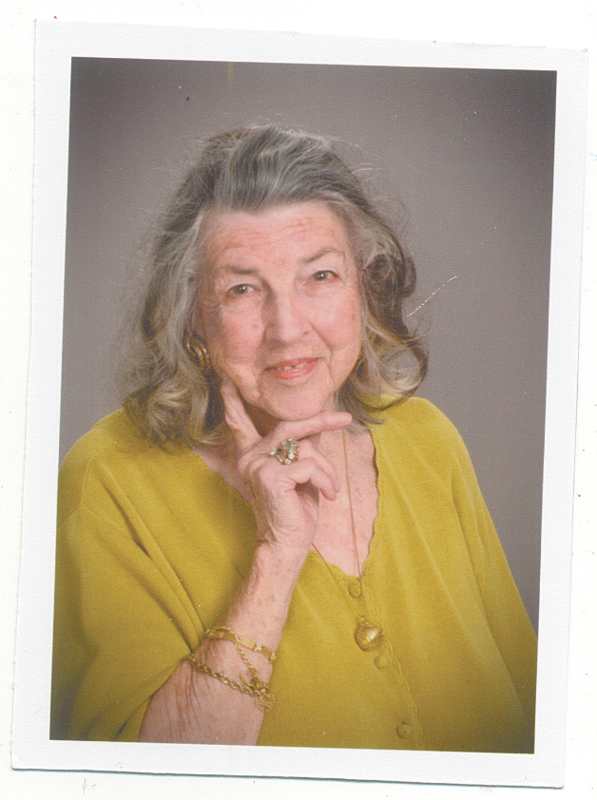 Having tucked away many of the possessions in her Cahaba Heights home that she and her husband of 63 years collected, Bobbye said that she has loved reliving her fond memories as she filters through to find the pieces that are best suited for exhibition. “When I shuffle off – I’m gonna go fighting, believe me – but, when I shuffle off, I can’t say that I haven’t had a wonderful life,” Bobbye said.